Attorney Thomas Wang is one of the partners at The Law Office of Thomas Wang. Mr. Wang proudly calls himself a “true believer” when it comes to criminal defense litigation. As early as his college years, Mr. Wang studied under Professor Laurence Benner, a famed criminal defense lawyer and criminal law professor. Mr. Wang’s academic abilities quickly shined through, which prompted Professor Benner to approach Mr. Wang with an intriguing challenge: to study alongside law students as an undergraduate. Mr. Wang gladly accepted the challenge. “The class was a huge challenge. I was competing with law students as an undergraduate!” Despite the clear disadvantage, Mr. Wang somehow beat out a class full of law students and graduated with the highest grade in the class. Two years later, Mr. Wang returned to law school, this time as a scholarship student. Mr. Wang would go on to accumulate many accolades during his law school career. Serve as the co-founder and President of the Criminal Law Association, etc. Perhaps more impressively, Mr. Wang accumulated his accolades all while he balanced a full time school and work schedule. With his eyes set on criminal defense litigation, Mr. Wang was determined to hone his skills through real life experience. As such, Mr. Wang served various stints at the San Diego County Office of the Public Defender. There, Mr. Wang handled a wide variety of cases ranging from misdemeanors to serious strike felony cases. In between his time serving the public, Mr. Wang also joined the Chula Vista Superior Court as an extern for the criminal division. There, Mr. Wang made recommendations that assisted judges to rule on various criminal motions and writs. 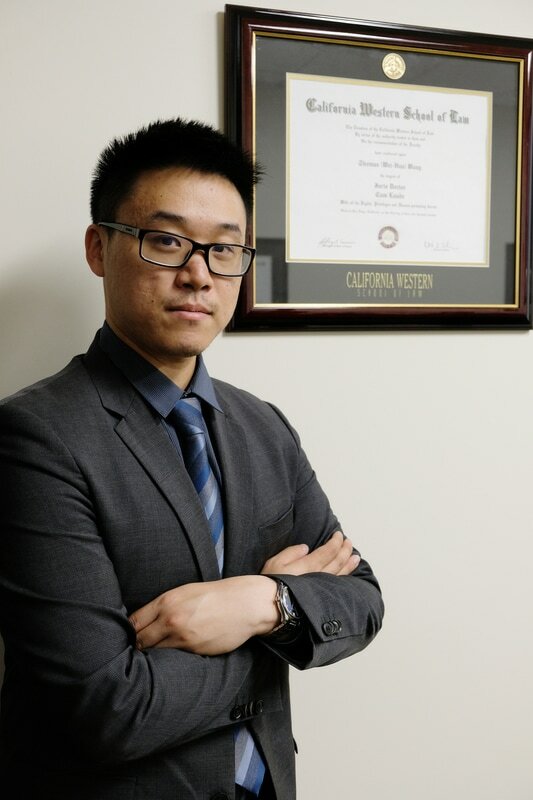 After graduating with honors from the California Western School of Law, Mr. Wang passed the famously difficult California Bar Exam on his first attempt. Shortly after, Mr. Wang started his own criminal defense practice. As a solo practitioner, Mr. Wang successfully defended his clients in a wide range of cases, including: DUI’s, domestic violence, assault with a deadly weapon, drug possession, drug cultivation, gang shooting, etc. Mr. Wang also served as an “of counsel” attorney for many attorneys in the greater San Diego and Orange County area. Outside of his criminal defense practice, Mr. Wang is also very involved in the community. He currently serves as the Vice President of the San Diego Chinese Attorneys Association, and is a member of both the California Attorneys for Criminal Justice and the Criminal Defense Bar Association.